Monarch Air Group provides private air charter in Salt Lake City, UT. Our clients benefit from top-notch service, unrelenting dedication to safety, wide selection of aircraft, and years of experience in chartering private jets. To obtain a free quote, please use our online quoting tool provided below, or call toll free 1-877-281-3051. 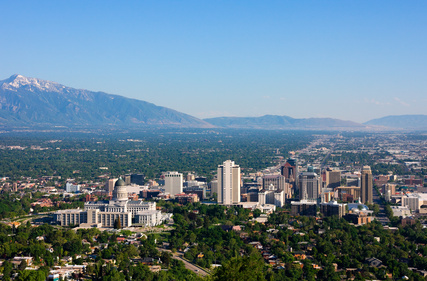 With population more than 1.6 million people, Salt Lake City is both the biggest city and capital of Utah. It is the political and financial center that was founded in 1847. Salt Lake City has plenty of historical and cultural landmarks such as the junction of the first transcontinental railroad, Episcopal Cathedrals, Roman Catholic, and Greek Orthodox, Fort Douglas, and the Twin Peaks. Salt Lake City is the home to several oil refineries. Located in a valley beneath the Wasatch Mountains, the city has a great location for ski resorts, hiking, mountain biking trails, camping, rock-climbing, fishing, and boating. Salt Lake City can offer its visitors a great number of cultural activities including the Sundance Film Festival and a couple of entertainment parks. 1. BMC, Brigham City, Brigham City, United States. 2. BTF, Salt Lake Skypark, Bountiful, United States. 3. DPG, Michael AAF, Dugway, United States. 4. EVW, Evanston, Evanston, United States. 5. HIF, Hill Afb, Ogden, United States. 6. OGD, Municipal, Ogden, United States. 7. PVU, Provo, Provo, United States. 8. SLC, Salt Lake City International, Salt Lake City, UT, United States. 1. The Grand America Hotel, 555 South Main Street, Salt Lake City. 2. Marriott Salt Lake City Center, 144 West North Temple, Salt Lake City. 3. Metropolitan Inn Salt Lake City Hotel, 524 South West Temple, Salt Lake City. 4. The Grand America Hotel, 555 South Main Street, Salt Lake City. 5. Little America Hotel – Salt Lake City, 500 South Main Street, Salt Lake City. 6. Monaco Hotel, 15 West 200 South, Salt Lake City. 7. Hilton Hotel, 255 South West Temple, Salt Lake City. 8. Salt Lake City Plaza Hotel At Temple Square, 122 West South Temple, Salt Lake City. 9. AAE Salt Lake Howard J, 121 North 300 West, Salt Lake City. 10. The Grand America Hotel, 555 South Main Street, Salt Lake City.